Have you ever worn a sweater or worse yet, a pair of socks with a seam that rubs and irritates. 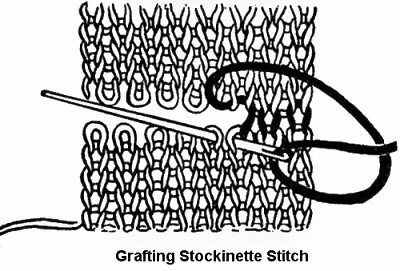 By a simple knitting method called grafting, you can avoid this and have seams that are invisible and comfortable. By using a blunt tapestry needle and matching yarn, you can make stitches which imitate those of the knitted fabric. To join, both ends should have the same number of stitches. You do not need to cast off; you can join while the stitches are still on the needle by withdrawing the needles stitch by stitch as you work. If you prefer, dampen the stitches slightly or run a thread through the stitches to prevent unravelling and remove both needles before starting to graft. Lay both pieces on a flat surface close together. Attach the yarn at the right hand edge of the upper piece. Put the needle down through the first stitch on the lower piece (knit-wise) and bring it up through the next stitch (purl-wise). Draw up the yarn. Put the needle down through the first stitch on the upper piece and bring it up through the next stitch. Put the needle down through the same stitch as before on the lower piece (the one the needle came up through before) and bring it up through the next stitch. Repeat these steps until all the stitches are joined. The needle enters each stitch twice, except the first or the last. Do not draw up the yarn too tightly. To join purled stitches, the stitch is reversed; the needle is brought up through the first stitch and down through the second, showing the top of the stitch instead of the sides. To join garter stitch, combine these two methods. Place the two pieces so the knit row on the top and the purl row on the bottom. Put the needle down through the first stitch on the lower piece and bring it up through the next stitch Draw up the yarn. Bring the needle up through the first stitch on the upper piece and put it down through the next stitch. The needle’s path is up-down on the upper piece, and down-up on the lower piece. The needle is inserted knit-wise. Up means purl-wise. You are purling the upper row of stitches and knitting the lower row. Joining ribbing is similar, go down-up for knitted stitches and up-down for purl stitches.